The FCA Group’s flagship Motor Village UK showrooms promise to deliver a greater user-friendly experience for customers following the launch of a new website. 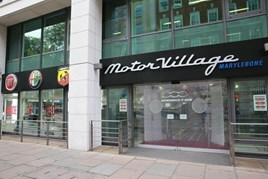 Covering the multi-franchise Motor Village showrooms in Marylebone and Croydon and the dedicated service and parts centres at Marylebone, Croydon and Battersea, the website offers customers in the showroom’s London market area the opportunity to browse, compare and arrange test drives of FCA’s exciting new car range. Rob Calver, managing director, Motor Village UK, said: “This modernized website will be of even greater value to our customers. The homepage of the new Motor Village UK website – developed by developed by specialist agency Visarc – features a showcase area displaying key models in each brand, details on used cars and servicing, a live Twitter feed with the latest updates, a current offers page and a newsletter sign-up button. A news and events library, careers section, and a contact information page are also included to complete the new site’s features, which will continue to evolve.